Huffing and puffing and blowing the NIH down? The biggest financial news of the fortnight had to be the U.S. government’s failure to avoid the sequester budget cuts, and the odd collective yawn it produced. Even with the sword of Damocles poised above various agencies, markets kept climbing – including the Nasdaq and AMEX biotech indices (respectively up 3% and 2.5% this week, as of this writing). The stock shrug led some to accuse President Obama and his supporters of crying wolf. Pre-sequester, one of the federal agency heads making dire predictions was NIH director Francis Collins, who said on a February 25 conference call that “somewhere in the neighborhood of 20,000 jobs will be lost.” Collins also pointed out the sequester will lead to delays and lost time in important drug development projects focused on cancer treatment, a universal influenza vaccine and Alzheimer’s disease. 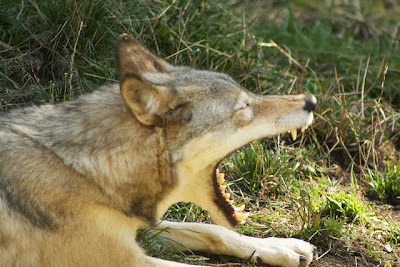 Now that the cuts are coming, we asked around to see if, in our little corner of the world, the wolf was still howling. In other words, how might the cuts trickle up into the biotech startup realm, with potentially fewer innovations to hone into new companies? Part of that trickle flows through the technology transfer offices of major non-profit research centers, so we started there. What do they think? Scott Forrest, the tech transfer chief at the prolific Scripps Research Institute of Technology in La Jolla, Calif. – which has helped spawn biotechs such as FoldRx Pharmaceuticals, now part of Pfizer, aTyr Pharma, CovX Research (also bought by Pfizer), Receptos and Ambrx -- told The In Vivo Blog he didn’t expect any near-term pain in the next, say, six months. "Beyond that, we’re practicing watchful waiting," said Forrest. "We just don’t know what to expect." We wondered if there's a correlation between NIH budgets and biotech company formation. Bob Coughlin, the head of the biotech trade group in Massachusetts, the state that receives the most NIH funding, told us "the long-term effect will be seen four, five, ten years from now when we don’t have new therapies and ideas in our pipeline of future companies." But the National Venture Capital Association has never done a study on such correlation -- and its life science policy VP Kelly Slone told FOTF she isn't aware of one. So until we crunch those numbers ourselves, there’s no precedent to gauge potential fallout by that measure. Todd Sherer, the president of the Association of University Technology Managers wouldn’t go as far as to predict the impact on company formation. But Sherer, who also runs tech transfer at Emory University in Atlanta, said funding does correlate to invention disclosures: "So if funding dollars go down, there will be some latency, perhaps two or three years, but expect to see a drop in the number of new invention disclosures that turn into licensable technology." Sherer also said that the tech transfer bottleneck, already an impediment, will only get worse. "Through the global financial crisis, universities haven’t increased patent budgets or [added staff], despite the federal funding increases and the number of new inventions arriving. So we’ve had more inventions coming our way, but no increase in staff or budget to handle them, and with fewer outlets [among VCs or pharmas to license them]. We’re just now coming out of a perfect storm. I’m afraid we left important innovation along the roadside during the financial crisis, and we’re about to head that way again," said Sherer. VCs like to say that the best technologies and product candidates will always rise to the top and attract money. But with the life-science venture population shrinking, and those remaining often in pursuit of later-stage investments that won’t take so long to mature, fewer VCs are even looking toward academia. As part of its annual A-List feature in January, START-UP asked dozens of life-science VCs to name the best sources of innovation. Only 15% said academia. Unscientific, true – but Sherer wasn't surprised by the sentiment. With universities dabbling more in translational science, and big drug companies forging ties left and right with academics, he said the odds of getting something licensed might be better when going "directly to Big Pharma and big biotechs and avoiding the start-up route. I haven’t seen data that that’s the case, but conceptually it seems possible." Wolf yawn photo courtesy of Flickr user ArranET.